I remember it vividly. It was near the holiday season, and I was on anything but a winning streak. I had recently been institutionalized for drugs and alcohol. I was going through a divorce, living with my dad, and watching my business fall into ruin. I was so depressed, the only places that I could muster the energy to go were the refrigerator and my 12-step meetings. I was a wreck. I was selling my company vehicles and equipment, one at a time, to make payroll and pay for my divorce. The only thing “peachy” in my life, was the cobbler. It was the peach cobbler, or chocolate cake, or whatever something sweet, that I would habitually stuff down my pie hole in the middle of the night. My midnight sugar binges were usually accompanied by about a quart of ice cream, paired alongside a half dozen Marlboro Lights. Things were not looking good, and there appeared to be nothing shiny coming down the pipeline, either. I needed a miracle. It all hurt so bad. My mom felt that the kids needed to remain in the same school, and with the same childcare, because they had endured enough change already. I had already put them through so much. Having them to change schools, would be an even further display of instability. My mom offered to pay for the next year’s private school tuition, as well as their “before and after school care”, while I (hopefully) got back on my feet. For whatever reason, pride I guess, I was having a hard time accepting the offer from my mother to pay for the children’s schooling. I desperately wanted to do it on my own. The only problem? It’s really hard to turn things around when your stuck under the covers, or in a bowl of ice cream, feeling sorry for yourself, the majority of the time. I really didn’t know how to handle the situation, so, naturally, I turned it into a struggle. I called my 12-step sponsor and we sat down to discuss my dilemma. He explained to me the difference between accepting and receiving grace. He also explained the necessity of having both sides of it in my life. He explained that without accepting grace, I could not be gracious. 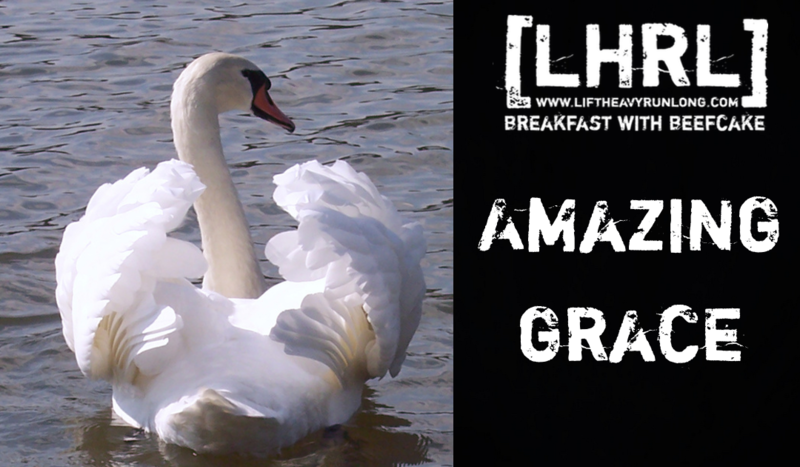 He also told me that being gracious was an instrumental part of being grateful. Gratitude, so I had been told, was going to be an extremely vital part of my life in recovery. It was important that I paid attention to this lesson. It seems that “grace” is something that I give to other people (usually when I want to feel good about myself). I do my best job of giving grace when there is an audience. This way I can “humbly” demonstrate what a good person I am. If there was a badge for humility…I’d probably wear it. An even larger problem than my selfish giving of grace, is my lack of willingness to receive it. I don’t want to believe that I need help, no one does. However, I need it. Lots of it. Tons of it. By the boatloads. I need help. What I learned is that gratitude is what comes of being grateful. Being grateful starts with being gracious, and being gracious is the act of accepting grace. Grace is the help that is made available to me. If no one allowed themselves to receive grace, there would be nothing to absorb the compliments, the encouragement, the forgiveness, or the help. There would be no real need to be kind or compassionate, because no one would benefit from it, if no one accepted it. The ego would be the only thing to consume all the grace, which would not be a good thing. Without the acceptance of grace, there really is no such thing as grace to begin with. It’s a two way street, as are most things which result in fulfillment. In order for someone to reap the benefit of giving grace, I must be willing to accept it, and that is the lesson I needed to learn. “You can handle the grace that your mother is offering you in any way that you like. You can accept it, graciously, or you can continue to pretend as if you don’t need it. That is strictly your decision. I do want to point out that, at some point, in some form- we all need it. If you want to repay her, you can start with being a better son, a better brother, a better father, and a friend. You can start by demonstrating that you were raised right, and doing a better job of putting her hard work on display. Grace is not monetary, and does not result in debt. Grace is grace. Plain and simple. If you receive it, it is yours to keep- that is why it is so amazing (someone should write a song about it). There are no contracts, stipulations, or hidden fees. A couple of things to remember is that maybe your mom deserves the feeling that comes with helping nurture her son to recovery (assuming you plan on progressing in recovery). And better yet, maybe this doesn’t have a damn thing to do with you, and has everything to do with her love of her grandchildren, in spite of her son’s bad decisions. Grace is a powerful thing. I’m glad to have it. Give some. Take some. Be gracious. Be grateful. Give grace. So, I think I met you around the time period that you wrote about in this post… I’m Phil Davis’ wife (y’all played ball together at G’town). We love reading your blog. I just have to be careful when I read it at work, because sometimes I end up laugh-snorting over it. Good stuff, Wilson. Write a book. We’d read it. This post was definitely written along the same time frame. I was not quite there yet, but was steamrolling in that direction. Both you and Big Phil were both very kind to me, as Phil has always been to everyone. I appreciate yalls compassion. Im glad that you get a kick out of the blog. I get a kick out of writing them. As for the book…. you never know.